Encompassing more than 140,000 acres of scenic beauty in southwestern Virginia, the Mount Rogers National Recreation Area offers outdoor enthusiasts a myriad of activities, from hiking, camping, and fishing to horseback riding, picnicking, swimming, tour driving, and biking. 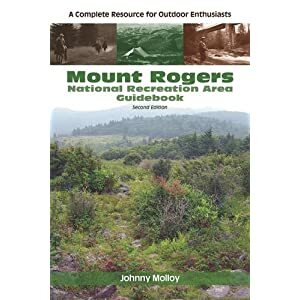 In the only comprehensive guidebook for this region, now newly updated, Johnny Molloy covers all of these activities and more, providing visitors with everything they need, including detailed maps, to enjoy the entire Mount Rogers area—one of the true jewels of Southern Appalachia. Molloy details the more than 430 miles of marked and maintained trails that criss-cross the Mount Rogers NRA and nearby Grayson Highlands State Park. Organized both by type, such as long trails and rail trails, and the areas they cover, including West Side, Central Area, Far East, and High Country, the trail descriptions include comprehensive, narratives of each hike, noting the various trail junctions, stream crossings, and trailside features with their distances from the trailhead. With each trail summary is an information box that offers quick access to such pertinent data as trail type (foot, horse, and/or bike), difficulty, length, degree of use, trail connections, and highlights. Complementing the sections on the extensive trail system are chapters on many other recreational options. Anglers will find lists of the best streams and tips for both fly and spin-cast fishing. For those seeking a way to cool off after a mountain excursion, the book locates the area’s favorite swimming holes. Molloy also reveals the best roads from which to view the gorgeous scenery and wildlife of the Mount Rogers area. Rounding out the guidebook is information on national forest and state park campgrounds, picnic areas, and accommodations and services in nearby towns, including motels, bed-and-breakfasts, outfitters, and stores. This path traverses the mostly open slopes of Stone Mountain. Along the way are significant vistas of Pine Mountain and much more high country. Leave the Scales Trail near Scales, and head south onto an open meadow, where rounded stone outcrops make mini vista points of their own. The Bearpen Trail then skirts a high elevation bog and descends in a mix of trees, brush and meadows while forming the boundary of the Little Wilson Creek Wilderness. The path ends at the junction with the Big Wilson Creek Trail. The trail once continued to a gap between First Peak and Second Peak, but the railroad grade that the trail followed has devolved into an virtually impassable muddy mess. Start the Bearpen Trail by veering left off the Scales Trail, .5 mile from Scales. Ascend among rhododendron while traversing several rills flowing off Stone Mountain to the left. Keep climbing into maple woodland. Leave the woodland for the open country at .2 mile. Keep alongside a wooden fence. There are far reaching vistas to the west across the East Fork Wilson Creek valley, including the Virginia Highlands Horse Trail. Begin to swing left, easterly, tracing the orange blazed wooden poles. Emerge onto a grassy clearing broken with a rounded stone outcrop that resembles a monument. An evergreen forest stands to the right of the grassy flat. At .5 mile, span a low wooden bridge that drains a high elevation bog to the left. Easily cruise through the rest of the meadow before twisting down into a hodge-podge of brush and trees. Pass through a gate. The trail is now the northern boundary of the Little Wilson Creek Wilderness. Intersect the Appalachian Trail at .9 mile. It leads left 6.1 miles to Fairwood Valley and right 10.9 miles to Elk Garden. On the Bearpen Trail, pick up and follow a railroad grade. Keep forward on the Bearpen Trail, now descending in deep woods. Wind around a muddy part of the grade that is hemmed in by a soil berm. Rejoin the grade before intersecting the Big Wilson Creek Trail at 1.2 miles. From here the Big Wilson Trail leads right, .8 miles to the Kabel Trail and 2.1 miles to Seed Orchard Road Trail at Grayson Highlands State Park. A sign here states, “Deep Mud, Travel Not Recommended.” This is the abandoned portion of the Bearpen Trail. It makes a very muddy track to a gap between First Peak and Second Peak. Do not proceed further on the Bearpen Trail! To reach the First Peak Trail, take the Big Wilson Creek Trail to the Kabel Trail, which then intersects the First Peak Trail. The Bearpen Trail is an interior trail. It can be reached by traveling .5 miles on the Scales Trail from Scales. This loop leaves the Whitetop Laurel Valley on the Beech Grove Trail up to the crest of the Iron Mountains. The loop then cruises the ridgeline to Feathercamp Branch and descends down the intimate stream valley to intersect the Appalachian Trail. Take the AT back to the Beech Grove Trail and return to the parking area. Along the way, enjoy streamside woods and open pine oak stands atop Feathercamp Ridge. The climbs are never overly steep or long. Flowing off the slopes of Mount Rogers in the Lewis Fork Wilderness, this nifty little trout stream offers scenic angling. Brook trout inhabit the steep pool/fall environment. Anglers here will be seeking an attractive fishing environment that ranges between 3,600 and 4,500 feet, as well as getting a few fish on the line. Fishing pressure decreases away from VA 603. Foot power is the only means of reaching this rivulet. The Lewis Fork Trail, starting on VA 603, climbs along the stream banks for a mile. The upper stretches of Lewis Fork can be reached via the Cliffside Trail.